The introduction of advanced analytics into today’s global manufacturing pipeline has provided planners and managers with a number of critical value propositions in leveraging enhanced reporting and metrics for reaching business outcomes and goals. Yet one of the most valuable applications of advanced analytics exists not on the side of revenue and profitability, but in the realm of reducing the risks involved with administering a global supply network. Because so much of today’s manufacturing industry exists in a variant-rich environment with network partners spread over disparate parts of the globe, the likelihood for significant disruptions or bottlenecks in the supply stream is ever-increasing. With a reliance on intelligent, integrated technology platforms and movements like Industry 4.0 and Big Data, advanced analytics gives manufacturing companies the capacity to review large pools of data in real-time to make critical adjustments to planning and production programs to avoid costly breakdowns across key areas of the value chain. Risk is no joke in today’s global manufacturing landscape, and the more players on the field means companies must work harder and smarter to mitigate risk - be it from a supplier who provides raw materials for production all the way to a transportation partner who helps move products from the production floor to the customer’s door. As such, advanced analytics has emerged as a powerful tool in the S&OP, S&OE, and production sequence planning worlds. More than just simply more detailed data sets, advanced analytics gives companies the agility and responsiveness to adjust to changes in the planning and production cycles without disrupting other elements of the manufacturing process. With this in mind, let’s examine the role of advanced analytics in reducing risk across the supply stream and how companies can leverage this advantage for enhanced productivity and efficiency. We discussed before in recent entries how advanced analytics is a key driver in leveraging end-to-end (E2E) visibility and insight into a manufacturer’s overall supply situation. Applying advanced analytics to a demand planning strategy - in conjunction with other intelligent planning solutions like BOM management, Plan for Every Part, and Every Part Every Interval - allows planners and managers to optimize their planning platforms to ensure continuous production devoid of bottlenecks or breakdowns. In addition, advanced analytics gives manufacturers the necessary tools to respond and combat potential breakdowns via detailed ‘what-if’ scenarios and forecasting. This means reductions in costs associated with weathering stoppages or shortages in production and greater control over the shifting parameters and restraints in planned production programs. While some decisions in today’s integrated supply chain still rely on human intervention, more and more decisions can be completed more accurately and with more efficiency via an automation platform. For example, the need to manage inventory levels and replenish certain component parts or manage the movement of containers in a yard are prime candidates for automation through the application of advanced analytics. In addition, job allocation, management of raw materials or resources, and job scheduling on the production floor are contexts in which advanced analytics gives planners more power and control over production programs. The monitoring, data gathering, reporting, and forecasting capabilities with advanced analytics make it more viable to allow for robotic platforms to execute these tasks with greater efficacy compared with human intervention. Not only does automated decision-making streamline processes and increase productivity, it can also significantly reduce costs and increase ROI (return on investment), which is critical for manufacturers to remain competitive in a growing marketplace. For years now supply chain planners and managers have worked to create a supply model capable of responding to complex and often unforeseen variables in the procurement and manufacturing stages to ensure continued production and on-time delivery. This push for an agile supply stream, while critical, is simply not enough in today’s global supply network where the need to reduce or even eliminate redundancies is crucial for growth and productivity. Enter the idea of the lean supply chain where processes are streamlined and operational platforms are reimagined to encourage a quicker, more efficient movement of products across the value chain. The melding of these two supply management models has emerged in recent years as an important platform for manufacturing companies with multiple production facilities across the globe. The agile-lean hybrid model is an ideal application for advanced analytics with its capacity for forecasting, reporting, and process enhancement throughout the supply stream. Advanced analytics bring the predictive functionality necessary for supply chain agility, while also supporting process simplification. Perhaps the most compelling advantage of advanced analytics is that they improve your organization's bottom line. According to recent Gartner surveys, companies with a more mature use of advanced analytics also often report lower costs and higher revenues. This is because advanced analytics directly improve demand capacity management by allowing real-time insights into the demand/capacity curve. 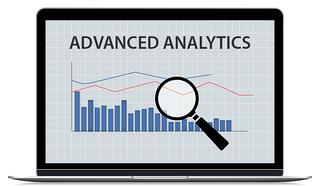 Additionally, predictive insights provided by advanced analytics enable more accurate and consistent forecasting across the organization, generally leading to more effective sales and S&OP processes. As you can see, the value of advanced analytics and its insights into the current and future overall supply situation can provide manufacturing companies with a unique window into the ways they can reduce risk and enhance the efficacy of their planning and production strategies. Because advanced analytics is a core driver in streamlining how companies plan for today and tomorrow, planners and managers can deploy advanced analytics to cut the complexity of today’s global supply stream and reduce the associated risks of doing business on a worldwide stage.